After The Collapse [devlog#12] Getting Released Soon! Well, it seems like I can post one last devlog before the release date! We should release After The Collapse between the 4th and 9th of October depending on some external factors. The devlog is going to be a bit shorter than usual, but I really wanted to showcase the last 2 missing features: Expeditions and Trading. I mean, a truckload of other things have been implemented, improved and fixed. But going over the last month of coding would spoil some of the fun. And quite frankly, too much has been done for me to list every single little detail. But, before that, a few announcements are in order! Firstly, I just opened the ATC Wiki. it’s extremely bare-bone presently, but this is where the complete documentation will end up, the same way I did for Unending Galaxy. Secondly, we have a discord channel now! You can join by clicking this link (and waiting a bit, so you won’t have any other choice than reading the rules). I can’t promise i’ll be on 24/24 obviously, but it’s a good way to catch me in a less formal context. 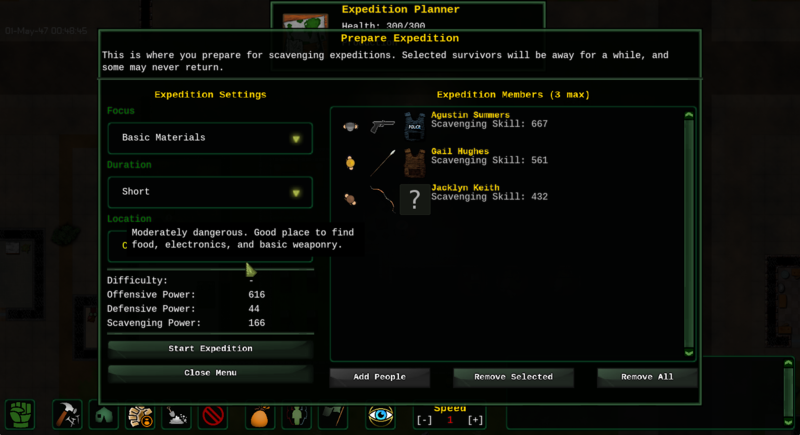 Technically, what I’m going to detail here is a menu driven placeholder for actual expeditions in the in-game engine. However, with proper care, it really has the potential to be a mini-game or even a standalone game of its own (much later down the line, obviously). This is where you select the people you want to send away, their destination, the duration of trip and what kind of resources you want them to focus on. 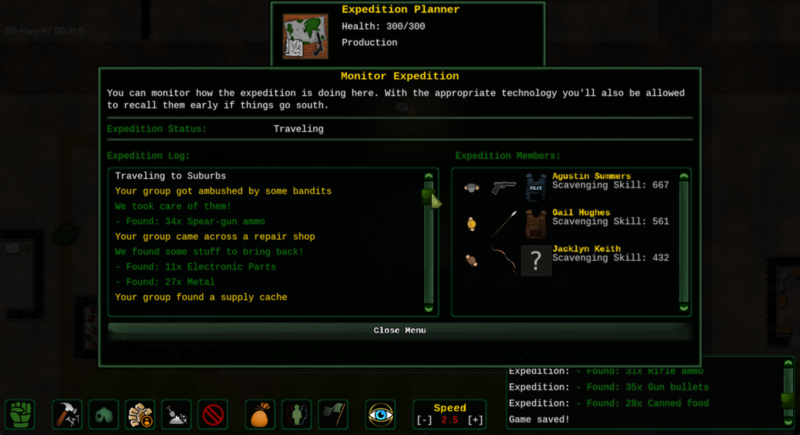 Each location has its own loot table and difficulty rating. While the exact details are hidden, it’s relatively straightforward. The closer to the center of the city, the more dangerous it is. Places like the commercial district are more likely to contain food than the industrial zone. You might also notice, in the bottom left corner, three indicators: offensive, defensive, scavenging power. On their journey your survivors will encounter various events, most of which will be testing one or several of those values. Initially, you’ll only be able to send 3 people at a time. With the appropriate technology (Live off the land) you’ll be allowed to send more people at once. Expeditions have tree parts. Firstly, your group will travel toward the destination. On the road, they will periodically come across random encounters. Some of which are good and other bad. Depending on the event, they will generally have to pass a skill check. If they succeed, they’ll get some loot, or other bonuses. If they don’t, someone might get sick, injured or even flat out killed. Your destination has a direct influence on the difficulty of those encounters. Then, what’s left of your group should arrive at destination. They will start searching the place for loot. Here, the scavenging skill is critical, people with a low skill are much less likely to find anything of value. And finally, they will head back home. Knowing the route, they won’t encounter any event during that phase (at least for now, might change that later). What your people can bring back is limited by their carrying capacity (based on strength), so they might come back will less stuff than what is listed in the log. A lot can be done here. New techs could further expand the group, allow them to re-roll bad encounters, increase the likelihood of finding rare loot, and so on. All of this being fairly easy to implement. It just depends if we want to keep that system in the long run or not. I know it’s difficult to convey the feeling in written form here, but in-game it’s pretty fun. When you’re lacking some crucial item, and send an expedition to (maybe) get it, it’s hard not to stay glued to the menu. Which is why expeditions logs are also copied to the normal game-log. It’s still a high risk, high reward system. People *will* die and get sick, but it’s intended. Merchants are specialized. In the menu above, it’s a weapon dealer. They will sell you weapons, ammo and armors and will buy raw materials, food and medicine. Generally speaking merchant won’t buy items of the same category they sell. For instance, the food trader won’t buy ingredients or crops, but it will happily take your weapons. Buying and selling rates vary slightly from a merchant to another too. And when proper faction relationships are implemented, we’ll probably overhaul that system a bit. Note that this is not a bartering system. Money is handled. 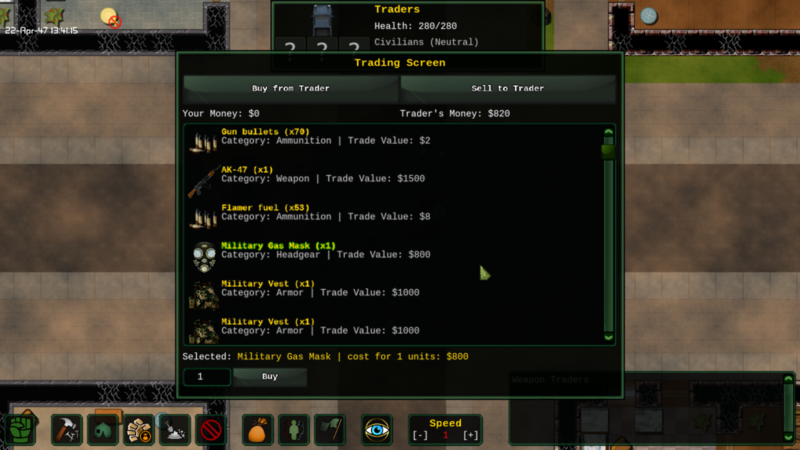 So even if you’re not interested in buying wares from a specific trader, you can still sell some of your surplus and wait for someone with more interesting goods. And, obviously, I haven’t forgotten about the combat system. Simply put, with the press of a button you can switch in and out of the manual combat interface. When enabled, your militia (any survivor with the military job enabled) will be under your direct control in the same fashion as in most RTS, click to select, right click to move or attack. The currently selected unit is highlighted in gold, military units in green, enemies in red and civilians/neutrals are in grey. Orders can be queued with the shift key (any of them, if you’re left handed). Military units will stay in position even when attacked and will fire at any hostile in their field of view granted you haven’t given them a specific target. It works very well to kite melee enemies with a single soldier, as it will follow your directions while automatically firing at the nearest enemy. I tried to illustrate that near the end of the video. Note that since the recording, attack targets are highlighted with a red cross, making things much less confusing. Civilians will continue to act as usual, unless you’ve built a shelter (a zone you can build anywhere on the map). In that case, they will stop whatever they were doing and go to the shelter zone. Depending on how you’re building your base, both options are perfectly valid. The bulk of the development this month has been geared toward making everything run as smooth as possible. However, due to time constraints, it’s very unlikely that the game features a tutorial. To make up for that, I’ve written a small guide on the steam community hub. The Wiki should have enough to get you started by the time we release the game as well. Note that if you’ve played any base builder before, After The Collapse shouldn’t prove very difficult to get used to anyway. After the Collapse is on Steam!